Eindhoven, January 2nd, 2017 – Diagnostiek Voor U (DvU), one of the largest private healthcare diagnostic services organizations in the Netherlands, selected Better Platform™ as their core system for managing patient records. Starting with the “Order to Invoice” digital innovation process, this project represents a flagship initiative where DvU is aiming to be recognized as next generation laboratory services provider by focusing on service excellence and exceptional patient experience. The project includes comprehensive lab information management, data/information exchange through IHE/XDS, a consolidation of applications and an integration layer which will optimize the performance of internal processes by basing all new developments on Better Platform™. The solution will be delivered and implemented by eCurae, Better’s local partner. The flexible and open nature of Better Platform™ allows the fast development and adaptation of the customer processes to changing requirements. The customer can select its own specialised software partners for the various aspects of the solutions. “The Better Platform™ fits very well in our ‘Best of Breed’ application landscape because of its excellent interoperability properties”, said Antoon Van Elderen, Head of Innovation and Information Management at DvU. “Through its open character we are able to efficiently take advantage of existing clinical knowledge concepts and define medical models that meet our process and business needs. We expect the platform not only to support our current business but also to help in the transformation of our business in the future”. “We are delighted to be part of an exciting initiative like the DvU digital program”, said Miroslav Končar, Business Development Director at Better by Marand. “We see a massive innovation potential with DvU, which by combining their existing knowledge and services with open data platforms and application development tools, can create new business models and innovative value added services for patients. We are honoured to be a partner in this process, and look forward to learning and helping DvU to succeed in this initiative”. Better’s vision for healthcare IT is coined as "Integrate. Open. Innovate." Better Platform™ is well aligned with this vision as it uses IHE-based standards to integrate existing devices, systems and data. By storing data in an open, vendor-neutral format it enables ecosystems of vendors to innovate. This approach is fuelling next generation solutions known as the Postmodern EHR. 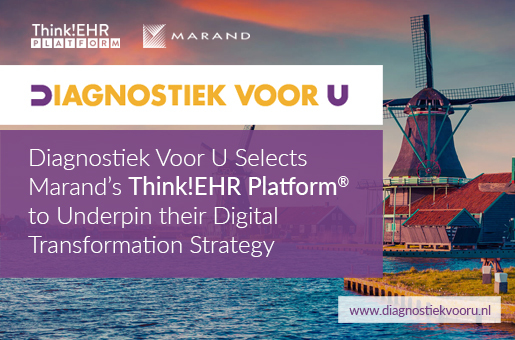 eCurae is an implementation partner for Marand’s Think!EHR platform™. eCurae focuses on providing open vendor-neutral solutions, supporting IHE/XDS, DICOM/VNA and openEHR for information management and exchange in healthcare, enabling better cooperation between healthcare providers and with patients. Diagnostiek-voor-U is a leading Medical Diagnostic Centre in the southern region of the Netherlands, focusing on blood- and urine-testing as well as imaging and functional diagnostics for the primary care sector.